Planning ahead now gives you options in the future. Federal Life retirement plans are designed to help you give your future self the gift of financial freedom. 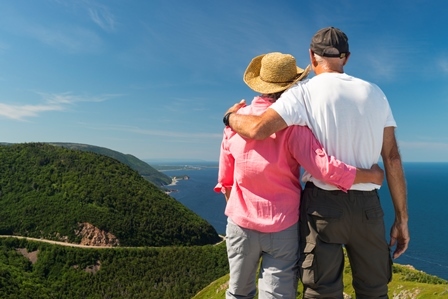 Federal Life can help you whether you’re just starting to save, are looking to diversify your retirement strategy, or are ready to start receiving retirement income. 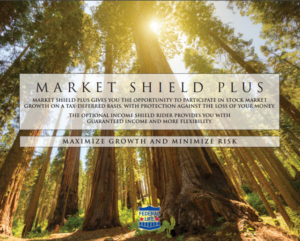 What is Market Shield Plus? Market Shield Plus is a single premium deferred annuity with fixed and index-linked options. It allows you to build your long-term savings by earning interest as the market increases, while protecting your principal during periods of decline. Your funds will be growing on a tax-deferred basis, too. Market Shield Plus offers three allocation options. There are 2 index-linked allocation options that earn interest on an annual basis, based on S&P500® performance. There is 1 fixed allocation option, which earns interest at a competitive current rate on an annual basis. • Earnings will never be less than zero. • Nursing Home Rider – This rider allows you to make either a full or partial withdrawal from your Account Value without incurring Surrender Charges if you are confined to a qualified nursing home. The Nursing Home Rider is automatically added to your base contract at the time of purchase, free of charge. Issue Ages: 0-74 (age last birthday). • Income Security Shield – Income Benefit Rider available for an additional annual fee. Market Shield Plus is a single premium deferred annuity with fixed and index-linked options underwritten by Federal Life Insurance Company. This brochure is not a contract. Refer to the policy for complete terms and conditions. Federal tax penalties may be imposed upon certain transactions. Review your personal tax situation and your use of annuities with your attorney or tax advisor. Index-linked returns do not include the portion of returns generated by the underlying index that come from dividends. The elements used in determining the interest rate from the index are not guaranteed after the first Contract Year and may be changed by the Company, subject to the guarantees in the Contract. Any such changes affect the return. The S&P 500 Index is a product of S&P Dow Jones Indices LLC (“SPDJI”), and has been licensed for use by Federal Life Insurance Company. Standard & Poor’s®, S&P® and S&P 500® are registered trademarks of Standard & Poor’s Financial Services LLC (“S&P”); Dow Jones® is a registered trademark of Dow Jones Trademark Holdings LLC (“Dow Jones”); and these trademarks have been licensed for use by SPDJI and sublicensed for certain purposes by Federal Life Insurance Company. Federal Life Insurance Company’s Market Shield Plus is not sponsored, endorsed, sold or promoted by SPDJI, Dow Jones, S&P, their respective affiliates, and none of such parties make any representation regarding the advisability of investing in such product(s) nor do they have any liability for any errors, omissions, or interruptions of the S&P 500 Index. * There is an annual rider fee that will automatically be deducted from your Account Value each year.